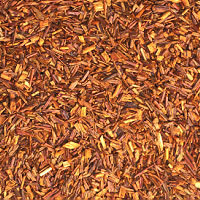 Rooibos is a nitrogen-fixing shrub native to South Africa. Its leaves are fermented and sun dried for use as a tea. Preliminary studies show that rooibos has antimutagenic and antioxidant properties, and has shown some ability to prevent radiation damage in animals. This research somewhat supports its traditional use to slow the aging process. Preliminary studies show that rooibos has antimutagenic and antioxidant properties, and it has shown some ability to prevent radiation damage in animals. This research somewhat supports rooibos’s traditional use as a cancer preventative. Rooibos is traditionally used as a tea as a digestive aid. Rooibos is a pleasant-tasting beverage that has been used traditionally to sooth digestion and relieve stomach cramps, colic, and diarrhea. Rooibos tea has also been used to relieve allergies and eczema, and to slow aging.